It sounds simple picking a pumpkin, carving it out then popping a candle inside, but rush it and you’ll be hurrying back down to the shops for a second go after destroying a perfectly good pumpkin. Here’s our top tips on how to carve your pumpkin like pro and perhaps try something a little different this Halloween. Knock on a pumpkin before buying, a hollow sound indicates a ripe pumpkin. Don’t worry if you’ve left it too late and only the small slightly squashed ones are left. These imperfections often make for the best pumpkin faces, ugly bumps can be warts on witches for example, evil things have bad skin you know? Once carved, store in a bucket of water until you’re ready to display it, then spray with lemon juice before use to keep it fresh looking. This is the hard graft of the process and is usually what puts most people off. First cut a circle in the top and cut out the lid at an angle instead of straight down. Pulling out the insides doesn’t have to be a messy job. Rather then starting at the top to take out the insides, use an ice-cream scoop to scrape around and down the sides of the pumpkin, pushing all the goop into the middle then just empty by banging the side over a bin. 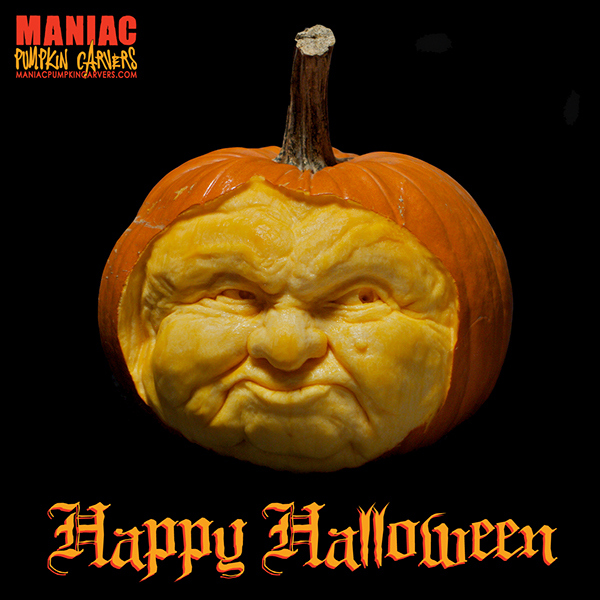 For the lazier among us there’s no need to carve out the pumpkin when you can just scrape or shave a scary face into the outside. Sure it can’t be lit from the inside this way but strategically placed lights and candles around the pumpkin can make it look just as scary. How scary do you want to go? Do you want a slightly manic but friendly ghool with a few missing teeth or do you want to scare the bejaysis out of the neighbourhood kids in order to keep them away? The scarier the more intricate a design so get online for many options. A serrated knife like a bread knife or a small dry-wall saw is best for cutting your picture/face out as the sawing action lends more control. You don’t need to cut all the way through but rather shaving or stopping short leaving a membrane can provide an interesting contrast when the light shines through. If you’re putting candles inside you may need to consider cutting a small vent in the lid. A red flashing bicycle light or lazer instead of a candle will create a cool effect. 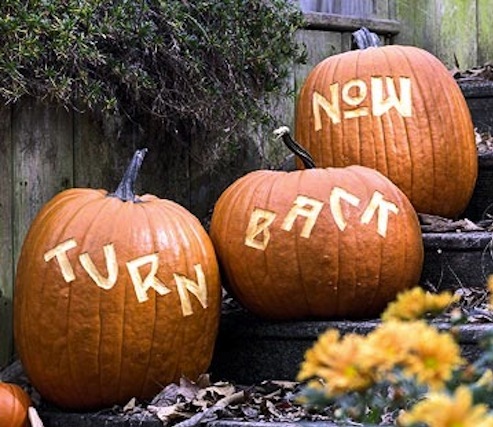 You don’t have to carve a face into the pumpkin. Sometimes the simplest ideas can be the most effective and get you more compliments than your neighbour who slaved away for hours. Why not just scrawl a chilling message into the pumkin, paint it black or have a severed arm or leg protruding from its jaws. There are good pumpkin carvers then there are those that are too good to even dream of aspiring to. We bow down and surrender to these.